The Morgan Silver Dollar was first introduced in 1878 by the US Mint and was struck until 1904. 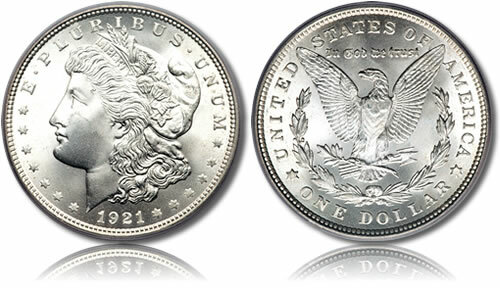 In 1921, the Morgan was again minted for a short period until it was replaced by the Peace Dollar. Few coins in the history of numismatics can claim such poor demand upon introduction and yet realize such high interest from collectors years later. In the mid 1870's, there was really no demand for silver dollars. In fact, the Liberty Seated Dollar, which was its predecessor, had last been issued in 1873. However, political forces, and not demand, would push the issuance of a silver dollar again. The Comstock Lode had been discovered in Nevada, and was yielding an estimated $36 million dollars a year worth of silver ore. This was significantly depressing the silver market. Consequently, silver interests persuaded those in Congress to pass the Bland-Allison Act which required the Treasury to purchase between 2 and 4 million troy ounces of silver each month to be minted into silver dollars. Mint employee George T. Morgan was chosen to design the new coin. Between the years of 1878 and 1904, over half a billion of the coins were struck with 96 different date-and-mint combinations, making a compete set almost impossible to acquire. Complicating collection even further, the Pittman Act of 1918 resulted in many of the Morgans being melted down and restruck as new coinage. An estimated 270 million of the original Morgans succumbed to this fate. Finally, in 1921, some Morgans were again minted but only until the design was replaced by the Peace Dollar. The obverse features a left-facing head only portrait of Liberty. At the time of introduction, US coins had a full-figure image of Liberty, making the Morgan quite unique. Also shown are "E Pluribus Unum" and the date of issue. Featured on the reverse of the Morgan Dollar is an eagle holding arrows and an olive branch. Also seen are the inscriptions "United States of America," "One Dollar" and "In God We Trust."